Activity in the luxury real estate market is surging in Vietnam, mirroring a booming economy that posted a 7.38% year-over-year increase in GDP in the first quarter of 2018—the country’s strongest in a decade. In Hanoi, plots in Starlake City, a multimillion-dollar planned community of luxurious villas and landed homes featuring a lake, international schools and office towers, sold out in a matter of days. In Ho Chi Minh City, luxury real estate developers are upping their game with projects like the Serenity Sky Villas, featuring penthouses asking 60.84 billion Vietnamese dong (US$2.64 million), with private elevators, designer lighting and furnishings—each with its own swimming pool on the balcony. Nearby, the premium tower of the Feliz en Vista residences—a 34-floor mix of garden villas, penthouse duplexes and sky mansions—boasts five-star facilities such as a VIP lounge, cigar bar, saltwater swimming pools, hot spring Jacuzzis, outdoor movie theaters and a treetop adventure walk bridge. “For the last three or four years, we’ve seen an increase in development activity, with new launches in the premium and luxury end of the market,” said Stephen Wyatt, head of Jones Lang LaSalle, or JLL, Vietnam. He points out that a change in foreign ownership legislation in 2015 gave international buyers the ability to acquire a long-term lease and buy property in Vietnam more easily. Now, foreigners are allowed to buy for a renewable term of 50 years, and for reasons other than personal use. In addition, developers can sell up to 30% of units in a condominium building and 10% of landed property in a residential compound to foreigners. Before, the allowance was a single unit. 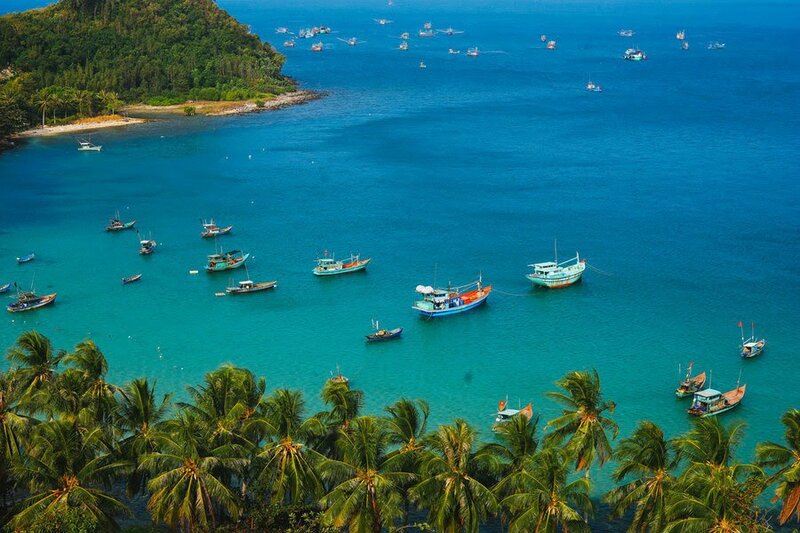 In addition to the major cities of Hanoi and Ho Chi Minh City, luxury real estate activity is heating up in the coastal cities of Danang and Nha Trang, beach towns like Ho Tram, as well as Phu Quoc island. “It’s an emerging market for luxury real estate, but it has a young, dynamic entrepreneurial population of 95 million whose wealth is growing rapidly,” Mr. Wyatt said. In fact, the country’s “middle and affluent class” is expected to double by 2020, according to The Boston Consulting Group, which will create additional demand for resale and leasing. This has not gone unnoticed by investors. May was an especially big month for the Ho Chi Minh City Stock Exchange. Vinhomes, the largest residential property developer in Vietnam, raised VND 31.1 trillion (US$1.35 billion) in an initial equity offering—the largest the country has ever seen. Vinhomes, which owns approximately half of the country’s high-end luxury condos, noted in a statement that the volume of its contracted sales is expected to reach VND 105 trillion (US$4.6 billion) by the end of this year, and jump again to VND 175.2 trillion (US$$7.6 billion) in 2019. Indeed, a recent Savills report revealed a 9% annual increase in apartment prices from 2013 to 2017, with average prices across the broader market expected to continue rising. Some of the grand Vinhomes developments in progress include the Berjaya Vietnam Financial Center, a mixed-use project in Ho Chi Minh City comprising of a premium office building, five-star hotel, serviced residences, and a shopping mall across 16.4 acres. According to Matthew Powell, director of Savills Hanoi (which manages roughly 10,000 units in the capital city), more developers are actively trying to enter the high-end property market in the country. Better still, “significant” demand is attracting developers, both domestic and international, Mr. Powell said. Helping the cause is the fact that they benefit from regulations that leave them less dependent on loans. In Vietnam, property can be pre-sold once the foundations—like infrastructure, street lights and landscaping—are completed. Despite the country’s status as an emerging market, the standards and expectations for luxury real estate are quickly improving as developers adjust, learn and adapt to international tastes. Sunny Hoang, associate director of International Residential Sales at Savills in Ho Chi Minh City, attributes skyrocketing demand to a low price point for luxury, as compared to other Southeast Asian cities like Bangkok and Singapore, where premium apartments cost significantly more. In Ho Chi Minh City, it can cost upward of VND115.3 million per square meter (US$5,000) for a luxury apartment close to vibrant city life and within a central business district, but elsewhere in Asia, like Hong Kong, it costs four times more. Domestic demand drives the majority of the market, but for real-estate buyers in Taiwan, Hong Kong, Korea and China who are keen on premium product, Vietnam is emerging as a better destination than in their own countries. “We’re seeing a lot of demand for luxury—higher than supply—so the next three to five years should be very good compared to other countries in Asia,” Ms. Hoang says. For investors, the return on investment is equally attractive. Because luxury apartments are in very limited supply, they correspond with higher capital returns, which have been increasing by double digits annually. She adds that opportunities are particularly good in District 1, Ho Chi Minh City’s central business district, and at properties with views of the Saigon River or close to the forthcoming metro public transit line, expected to be completed in 2022. A tourism boom in coastal Vietnam is another contributor to the rise of Vietnam’s luxury residential market. Danang, along with other coastal cities like Phu Quoc, Ho Tram and Quang Nam, are experiencing a growing market for vacation and second homes, due to world-class golf courses, tourist hotspots and a solid infrastructure. For instance, hilltop three-bedroom villas at the Banyan Tree Lang Co Residences, which cost VND29.5 billion (US$1.28 million) and are within striking distance of the Danang airport, boast panoramic ocean views and a private pool, and are decorated with locally inspired furnishings. Mr. Blackhall noted that certain regulations on foreign ownership, particularly when it comes to reselling property, are still unclear, but the number of overseas buyers should continue to grow over the next decade as mass transit systems in Hanoi and Ho Chi Minh City, and new airports in Phu Quoc and Danang, are completed. “If you look at Vietnam from a geographical perspective, it’s in the center of Southeast Asia, there are lots of recreational opportunities like golf courses and casinos under development, as well as an enormously long coastline—and coastline views sell,” he says. As the economy continues to grow, developers anticipate more expats seeking high-quality housing, and to close that gap, are launching more luxury projects to match the expectations of foreign buyers and investors. In fact, CBRE, the world’s largest commercial real estate services and investment firm, reported that the total supply of luxury apartments for sale in Ho Chi Minh City sits at approximately 4,000 units. Meanwhile, the population of the largest city in the country is pushing past 10 million. The upward trend is already visible in the improved quality of new launches and rapidly increasing property prices, with square-foot prices in central business district areas approaching VND 12.84 million (US$557), up from an average of VND 9.64 million (US$418) just two years ago. “Vietnam is still behind Bangkok and tier two and three cities in China, but the general feeling is it will catch up within the next five or 10 years,” Mr. Wyatt said, adding that JLL forecasts up to 10% annual growth in residential real estate values in major cities this year, with more gains on the way.